I didn’t expect to be posting here until the cast came off since there’s little in the way of crafty things that I can do. But I actually ended up finding something new I can do & thought I’d put up a quick photo. Even though I’m left-handed (and the cast is on my left arm) luckily I’m right-handed for a few crucial things, like hand-sewing and embroidery and using scissors. I was trying to piece hexagons at first, clipping them together with a wonder clip instead of pinching them together. But it was slow going, and I got frustrated. I tried doing some embroidery, but I needed to use my left hand in small ways that I never noticed before. I got the idea to try some blackwork embroidery, figuring I might be able to manage that one-handed. It’s going reasonably well so far, and it’s a lot of fun. The stem stitch outline is really wobbly — that was tougher to manage one-handed than the blackwork filling. I’m going to whip around it or something after it’s done to try to disguise the wonky parts. A while back I downloaded the Ensamplario Atlantio collection from String or Nothing and I’m finally trying it out. 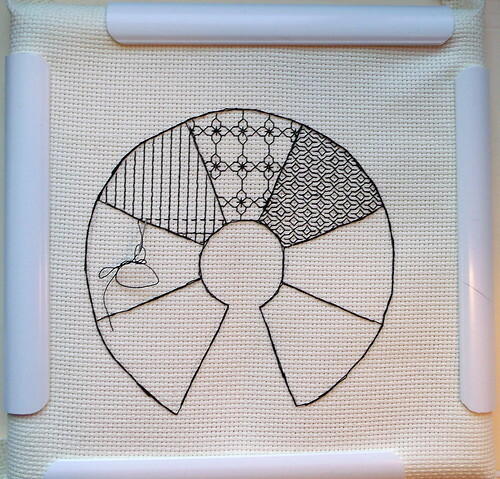 I’d never done any blackwork before, and it’s going okay for a first try, I think. I’m using crochet cotton since I don’t have enough hands to separate embroidery floss right now, and it’s definitely doable with one hand. So as not to be stuck with just one project, right now I’m also defacing a perfectly good pack of playing cards to try tablet weaving. Not sure yet if I can do it with one hand, but I’m giong to give it a shot. I’m going to use some of the odd-looking handspun yarn I made when I was learning to spin and see what I end up with. Cast comes off for more x-rays a week from today. I could possibly be done with the cast by then, but I’m not getting my hopes up too much. That’d be such a relief, though. Hi! Thanks for your kind words! I’m delighted you are enjoying Ensamplario Atlantio. I get a big thrill out of seeing what mischief the “pattern children” get up to out in the wide, wide world. I’m impressed that you’d try this with your off-hand. I don’t think my stem stitch would behave if done lefty. Best wishes for project success, and swift healing. -K.
I really love this! And I’m so sorry about your wrist. I’m left-handed, too, and when I was in fourth grade, I broke my wrist. I hope it heals quickly, but I’m glad you found something crafty you can enjoy in the meantime!